Below are the best articles we have found for some of the most common questions we receive about ownership and enjoyment of the piano. Musical instruments with keyboards have been evolving since 220 B.C. when a Greek engineer named Ctebius created the “Hydraulis” to demonstrate, of all things, the principle of hydraulics. The Hydraulis led to the organ and a technical evolution of that instrument that has spanned centuries. Meanwhile came more instruments based on the concept of multiple strings, hammers and keyboards. First was the dulcimer, a multi-stringed instrument played with hand-held hammers. It has been claimed that the dulcimer was invented in the 9th Century A.D. by Persian Abu Nasre Farabi, who called it a Santur. The dulcimer has even been called “the first piano,” but wait. The invention of the piano is most widely credited to the Italian Bartolomeo Cristofori (1655-1731) in the early 1700s. By then, several more stringed keyboard instruments including the clavichord and harpsichord had come into play. The harpsichord couldn’t control the sound volume and the clavichord couldn’t produce the tone needed by the artist to perform in large halls. Cristofori had the solution. While Johann Sebastian Bach and others failed to embrace the pianoforte, Lodovico Biustini published “Sonate da Cimbalo di Piano e Forte,” the first work specifically for piano, in 1732. Yet nearly half a century passed before the next composer was to write specifically for the piano. It was Muzio Clementi, whose “3 Sonatas, Opus 2” in 1770 triggered the emergence of the new playing techniques and styles of expression needed to master the piano. The piano’s pivotal turning point arrived in the late 1770s when Johann Christian Bach redesigned it and more composers came forward with more music for the piano. Soon there were solo piano performances to packed concert halls in Europe and from there, the piano found its way to Great Britain and America. Here the piano evolved from a fashionable status symbol in the mansions of the rare few to the mass assembly lines of Jonas Chickering and Heinrich Steinweg. Thanks to their industry, the public came to regard the piano as a necessary part of every American household in the late 1800s. Knowing how to play it was considered the best way to win admiration, love and respect, especially if you were a woman. By now the piano had been through all manner of transformation: square, vertical upright, grand and variations of same, with all the accompanying technical changes. Piano design and manufacturing thrived in Germany, Austria, France, Great Britain and America. But at the turn of the century, just when the piano had achieved prominence as the primary source of home entertainment, oops, here came the movies and the phonograph. Not to mention the player piano, which “automated” what many piano owners couldn’t do. Then the gramophone and the radio took over where the player piano left off. Renewed public interest didn’t hit until the 1930s when piano makers introduced the miniature upright. From there the piano has reached unprecedented standards of quality through significant technical and cosmetic change brought on by new materials, processes, techniques and innovative genius. Today this amazing 5,000-piece invention is not the household staple that it used to be, but it remains a solid investment and the treasure of those who find fulfillment in the piano as a means of creative expression. 2) Playing the piano makes you feel (and look) sophisticated. Truly. No matter who you are or how many warts you have, you’ll just exude class the second you begin tickling those ivories. 3) Piano playing keeps your brain active. It’s very hard for your brain to rot when you consistently throw it the musical language to interpret. 6) People will automatically assume you’re a genius. Honestly, I’ve heard this a lot. People uttering “He/she plays the piano” in the same tone reserved for “He/she has an IQ of 174.” You just can’t help but admire someone playing an instrument. 7) Piano playing is good for your hands. Indeed it is. I probably have stronger hands/fingers than most people I know. And have you ever noticed the hands of a pianist? Beautiful, long, tapered fingers. Chances are that if you’ve ever admired someone’s hands, they play the piano. 8) Pianists never quit learning. There’s absolutely no way to memorize every musical piece on earth. You could learn 10 new songs a day for the rest of your life without scratching the surface of songs out there. 9) Piano playing is FUN. Really. It’s one of the funnest things I do. Think about it, why would so many of us do it if it weren’t a blast? 11) Piano playing is SATISFYING. It’s truly one of the most satisfying things you can do. (Right after touching your nose with your tongue. Or so I hear.) There’s no feeling like playing a difficult song and playing it flawlessly. Quite an ego-boost. Children can start taking piano lessons at the age of four when they already know ABCs and numbers. You don’t have to wait untill your kids show interest in piano. You can always start introduce the instrument to them. When they can learn fast and enjoy the lesson, you know that it’s in their blood to play piano. When you planned to give your kids piano lessons, you better start planning to buy a piano if you don’t have it already. Piano player, even the professional ones still need to practice on the daily basis. Piano lessons need more than just understanding and memorizing, the fingers need to feels the lessons through practices. So it is very crucial to have a piano in your house. You should not substitute piano with keyboard or digital piano. At this early stage of learning piano, the fingers are going to an important stage of forming the muscle. The kids also learn to coordinate their fingers with the sounds they make. 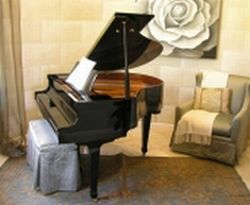 Accoustic piano give an unlimited sounds that will influence the sensitivity of ears from the sounds it makes. It doesn’t have to be a good piano from an expensive brand, but an ordinary accoustic piano will do. A used ones will work nicely too. You can always try to rent them if you can’t afford to buy one. Last but not least. When choosing a piano teacher, you should examine if that person is really just a player or is a teacher. You will need to find a teacher. Not all piano player is a good teacher. Dini Shanti is a working at home moms who own a site dedicated for moms including articles about piano. Please keep the links active when using this articles on your website. Care and maintenance of pianos. In positioning your piano, you should strive for evenness of humidity and temperature. Since a piano is made mostly of wood, it is greatly affected by seasonal change. If there is lots of variation in humidity and temperature, your piano will easily go out of tune. Humidity fluctuations can also cause cracking of the wooden soundboard and damage to the finish. For these reasons you should never put a piano next to a frequently opened outside door or in front of a picture window. Never put it near heating ducts, hot air registers, or radiators. Protect the piano against direct sunlight, humidity and sudden changes in temperature. You need to ensure a temperature of about 72 degrees Fahrenheit and a humidity of about 40 percent. If you can’t control the environment of the house, if you can’t find a suitable location, consider installing a climate control system in the instrument itself. This will take care of climate-related problems. If you prize your piano, you will tune it regularly. Domestic pianos should be tuned roughly once every four to six months. For those playing in concert halls the piano is tuned just before every performance. It is important to tune the piano regularly. The longer a piano remains out of tune, the more time and effort a technician will need to restore correct pitch. When moving the piano to a new environment wait a few weeks for it to become acclimated. Only then should you tune it. Your piano should be cleaned and polished carefully so as to avoid introduction of any fluids into its interior. To avoid the abrasive effect of dust consider using a feather duster rather than a cloth. When a cloth is used it should be soft. You should clean the keys with a sponge dampened with water or a very mild soap. The piano lid should be closed only when necessary. While the lid provides protection when the piano is not in use, it can also lead to yellowing of the white keys. Take proper care of the inside of your piano. Bug sprays and mothballs should not be used. Don’t try to oil it yourself. Don’t place drinks and other liquids like cosmetics, any kind of Aerosol, insecticides, paint thinner or petroleum-based products on top of the piano. They can spill inside and cause metal parts to rust and wood parts to stick. A professional should clean the inside once every three years. Many problems can be prevented by playing your piano frequently. These include the accumulation of dust and rust. Mantius Cazaubon offers a guide to help you choose a musical keyboard that meets your needs on his site www.Yamaha-Keyboard-Guide.com Visit Yamaha Keyboard Guide.com for Yamaha and other music keyboard reviews. Sometimes all it takes to get started down the road of music is a beginner piano lesson. How many times have you told yourself that you should learn to play an instrument before it gets too late? And how many times have you put off your first lesson because you just don’t have the time, or because you don’t know where to go? When you learn online, you eliminate the need to go looking for lessons because everything can be accomplished in the comfort of your own home.For many people, learning to play the piano may seem intimidating, especially for those who are older. The piano may seem like it is a difficult instrument to play, but once you have your first lesson, you will realize it is not as hard as it looks. Sometimes all you need to do is rely on your hearing to learn how to play songs that are both easy and more complex.Once you find the right online source that can instruct you on how to play the piano, you need to kick back and trust that they know what they are doing. Take a look at the testimonials and see how others have learned to play music. You will find that people of all ages and from all backgrounds are just as interested as you in learning to play the piano. And just how successful they have been. If you don’t already have a piano in your home, you can buy a small keyboard to get started. Your main goal when you first start to learn the piano is to play a few notes and simple songs. Once you come to the end of your online piano course, you may find that you want to purchase a piano in order to improve your sound. But to start lessons, a keyboard is all you need. Online piano courses are designed in such a way that you start off slowly, stepping up the pace as you build up confidence and skill. Learning at your own pace allows you to master each lesson plan before you’re ready to move on. This means that you will have all the concepts you need before you move on to the next lesson, which increases your ability to be more proficient at playing the piano. After your first beginner piano lesson, you will be ready to start taking your lessons seriously. In no time at all, you can be playing the piano like an expert for your family and friends. Hear and Play specializes in providing piano lessons and learning guides for those who wish to become more proficient in playing the piano by ear. Our programs are designed for beginners and advanced players – everyone has the opportunity to refine their skills and successfully play piano by ear. Contact us at http://www.hearandplay.com/ to learn more. Visit www.HearandPlay.com for more information about a beginner piano lesson and the various other music programs we feature.